High-energy jets powered by supermassive black holes can blast away a galaxy’s star-forming fuel, resulting in so-called “red and dead” galaxies: those brimming with ancient red stars yet containing little or no hydrogen gas to create new ones. Now astronomers using the Atacama Large Millimeter/submillimeter Array (ALMA) have discovered that black holes don’t have to be nearly so powerful to shut down star formation. 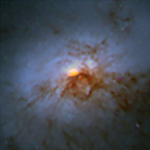 By observing the dust and gas at the center of NGC 1266, a nearby lenticular galaxy with a relatively modest central black hole, the astronomers have detected a “perfect storm” of turbulence that is squelching star formation in a region that would otherwise be an ideal star factory. This turbulence is stirred up by jets from the galaxy’s central black hole slamming into an incredibly dense envelope of gas. This dense region, which may be the result of a recent merger with another smaller galaxy, blocks nearly 98 percent of material propelled by the jets from escaping the galactic center. Right now a doomed gas cloud is edging ever closer to the supermassive black hole at the center of our Milky Way galaxy. These black holes feed on gas and dust all the time, but astronomers rarely get to see mealtime in action. Northwestern University’s Daryl Haggard has been closely watching the little cloud, called G2, and the black hole, called Sgr A*, as part of a study that should eventually help solve one of the outstanding questions surrounding black holes: How exactly do they achieve such supermassive proportions? The closest approach between the black hole and gas cloud is predicted to occur any day now. 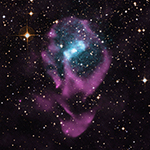 Haggard has been using two world-class observatories, the Chandra X-ray Observatory and the Very Large Array, to gather data on this potentially spectacular encounter. An international team of astronomers exploring the disk of gas and dust around a nearby star have uncovered a compact cloud of poisonous gas formed by ongoing rapid-fire collisions among a swarm of icy, comet-like bodies. The researchers suggest the comet swarm is either the remnant of a crash between two icy worlds the size of Mars or frozen debris trapped and concentrated by the gravity of an as-yet-unseen planet. Using the Atacama Large Millimeter/submillimeter Array (ALMA) in Chile, the researchers mapped millimeter-wavelength light from dust and carbon monoxide (CO) molecules in a disk surrounding the bright star Beta Pictoris. Located about 63 light-years away and only 20 million years old, the star hosts one of the closest, brightest and youngest debris disks known, making it an ideal laboratory for studying the early development of planetary systems. The Karl G. Jansky Very Large Array (VLA) will get a new system allowing it to continuously monitor the sky to study the Earth’s ionosphere and detect short bursts of radio emission from astronomical objects. The National Radio Astronomy Observatory (NRAO) and the Naval Research Laboratory (NRL) signed a $1 million contract under which NRL will fund a system to capture data from low-frequency radio receivers mounted on VLA antennas that will allow simultaneous and completely independent operation alongside the VLA’s standard scientific observations. “This essentially will turn the VLA into two telescopes, working in parallel to perform different types of scientific research simultaneously,” said Dale Frail, NRAO’s Director for New Mexico Operations. The new system, called VLITE (VLA Ionospheric and Transient Experiment), will tap data from 10 VLA antennas, and is a pathfinder for a proposed larger system called the Low Band Observatory (LOBO) that would equip all 27 antennas of the VLA. “The new system will operate independently of the VLA’s higher-frequency systems, using a separate path for data transmission and processing,” said Paul Ray, NRL’s VLITE system engineer. With the help of NASA’s Chandra X-ray Observatory and the Australia Telescope Compact Array, an international team of astronomers has identified the glowing wreck of a star that exploded a mere 2,500 years ago — the blink of an eye in astronomical terms. The observations, made by a team led by UW-Madison astronomy professor Sebastian Heinz, reveal an astrophysical novelty of the Milky Way: a glowing nebula created when the star exploded and, inside of it, the collapsed core of the exploded star, a neutron star, still clinging to its former companion star. It is the only known example of such a system in our galaxy. The new observations are reported Dec. 3 in the Astrophysical Journal and are important because they provide a unique laboratory to test key theories of stellar evolution, especially about the stage of a star’s life just after most of it has been obliterated in a supernova explosion.